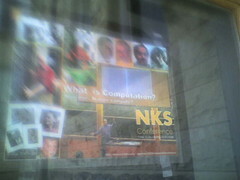 The NKS Conference is here next weekend; there are posters plastered all around the building announcing it. Presumably, the conference has to do with the ideas presented in the oft-criticized book of the same name. What does the OT stand for? It's a pun on NKOTB, and probably only funny to people born before 1988. Dunno what you're talking about -- New Kids are timeless! I've heard of New Kids on the Block, but I just didn't get the pun. :( Apparently, they were going on strong until 1995, though. I did not know that. They were going until 1995, but I don't think they were going strong. When I was in second grade (1990), they were the height of coolness. By the time I was in fourth grade (1992), they were the epitome of uncoolness. My sister and I had a tape case (heh) that we puff-painted (heh) with the words "NKOTB Forever" in second grade. In fourth grade we crossed out the "Forever" and wrote "Never". True story. 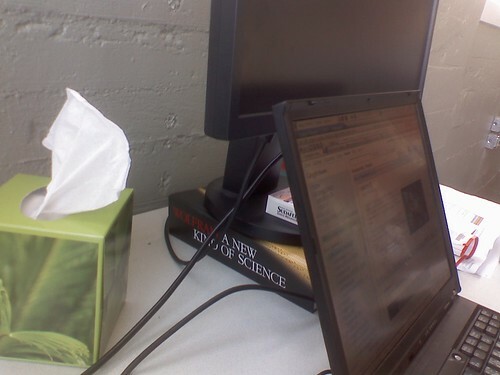 NKS makes an excellent monitor stand. yes my desk really has looked like this for weeks. Re: NKS makes an excellent monitor stand. You actually sit at a desk now? Weird!